In specifying the ideal capacitor most designers would start with high volumetric efficiency and then consider miniaturised packages and capacitance stability over applied voltage, frequency, temperature and time. A low equivalent series resistance (ESR), noise-free operation, high ripple-current handling capability, and a decades-long life expectancy would also feature on this technical wish-list. Whilst conventional solid, MnO2 tantalum capacitors meet many of these criteria, the latest polymer tantalums offer significant improvements in performance. Capacitance retention is improved at higher frequencies up to 500kHz and ESR is reduced to as low as 5 mOhms. Polymer tantalums are also rated at up to 75V and have more relaxed derating guidelines. The inherent risk of ignition or smoke during a short-circuit failure of a solid tantalum capacitor has also been eliminated with the polymer tantalum’s benign failure mode. 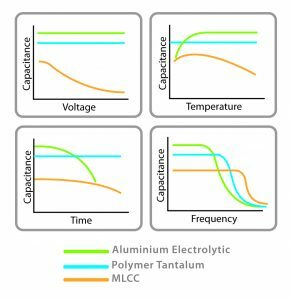 The capacitance stability achieved by polymer tantalum capacitors exceeds that of MLCCs over time, temperature and voltage. Whilst MLCCs are susceptible to aging, polymer tantalums achieve long-term stability over an operational lifetime of 20 years. This longevity also makes polymer tantalums a viable alternative to aluminium electrolytic capacitors which can dry-out in use and may require re-forming after a shelf-life of 2 years or less. The lack of a significant change in capacitance when polymer tantalum capacitors operate at temperatures down to -55°C is a major advantage over capacitors containing a liquid electrolyte. However, their upper temperature limit of 125°C is lower than that of MnO2 capacitors which include versions which can operate at temperatures of up to 200°C. A relatively high equivalent series resistance (ESR) has always been a weakness for conventional MnO2 capacitors which typically have ESR of 40 to 50mOhm. The capacitance roll-off experienced by MnO2 at frequencies above 10kHz has, therefore, limited their use in some applications. In contrast, polymer technology can reduce ESR to as low as 5mOhm, which ensures useful capacitance is available at frequencies of up to 500kHz. Tantalum is not the only capacitor technology in which polymer is being used to enhance stability. For frequencies approaching 1MHz, the 2mOhm ESR achieved by polymer aluminium capacitors can provide slightly higher capacitance retention without adding to design complexity. This reduced ESR does, however, have to be traded-off against the lower maximum capacitance of the polymer aluminium which is just 50% to 80% of a polymer tantalum in the same package. For applications in which miniaturisation is a priority this could be critical. The minimum case size offered by a polymer aluminium capacitor is 7343, compared to 0805 for polymer tantalum. The voltage range of polymer aluminium capacitors is also capped at 35V whereas polymer tantalums can be used in applications up to 75V. The selection of tantalum capacitors is not always limited to electrical performance, but can also be also affected by ethical and commercial issues. Much of world’s tantalum ore is extracted in the Democratic Republic of the Congo (DRC) where years of armed conflict have seen militias using the tantalum and other mines to fund their activities whilst inflicting severe human rights abuses. The world’s response to this has been the introduction of US legislation such as the Congo Conflict Minerals Act of 2009 and a new EU law, announced in March 2017, which will become effective in 2021. Both of these regulations require companies to provide the traceability necessary to ensure that their supply-chains are free from conflict minerals. Many companies decided that the simplest compliance strategy would be to avoid any trade with the DRC. By taking a more radical approach to the eradication of conflict minerals from the supply-chain, capacitor manufacturer Kemet, has fundamentally answered the ethical issues surrounding the sourcing of tantalum ore. Working in partnership with a certified conflict-free mine in the DRC allows Kemet to ensure that the mine operates in accordance with codes such as iTSCi and that the revenues are fairly distributed to miners and the local community. This not only frees OEMs from the ethical constraints of using tantalum capacitors, it also helps to eliminate supply risk, price instability and lead-time fluctuations. The combination of low ESR with higher voltage, stability and frequency, in addition to more stable and ethical sourcing of the tantalum ore, means that designers can now apply the benefits of polymer tantalum technology across a wider range of applications.